Rabbit anti Human, Mouse, Rat FAM120B. PGCC1 antibody was raised against an 18 amino acid peptide from near the carboxy terminus of human PGCC1. The transcription factor peroxisome proliferator-activated receptor gamma (PPARg) plays essential roles in adipogenesis by regulating adipocyte-specific genes through association of various co-factors. One such co-factor, PGCC1 (also known as FAM120B), is widely expressed in adult tissues and throughout embryonic development. Overexpression of this protein in OP9 pre-adipocytes promoted their differentiation into adipocytes, and knockdown of PGCC1 expression through RNA interference blocked this process. PGCC1 is homologous to C9orf10 (also known as FAM120A) and has been mapped to chromosome Xp11.22. 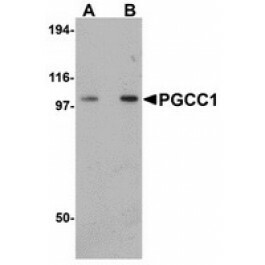 At least two isoforms of PGCC1 are known to exist. Berger J and Moller DE. The mechanisms of actions of PPARs. Annu. Rev. Med. 2002; 53:409-35. Li D, Kang Q, Wang DM. Constitutive coactivator of peroxisome proliferator-activated receptor (PPARgamma), a novel coactivator of PPARgamma that promotes adipogenesis. Mol Endocrinol. 2007 Oct;21(10):2320-33. Epub 2007 Jun 26. PubMed PMID: 17595322. Holden S, Raymond FL. The human gene CXorf17 encodes a member of a novel family of putative transmembrane proteins: cDNA cloning and characterization of CXorf17 and its mouse ortholog orf34. Gene. 2003 Oct 30;318:149-61. PubMed PMID: 14585507. This antibody detects FAM120B. It will not cross-react with FAM120A.